Last Saturday four of our members had the privilege to attend the Grace Hopper Celebration of Women in Computing in Baltimore, Maryland. The trip was incredibly inspiring for all of us and we agreed that we will raise funds to send UCI students to Grace Hopper every year. We met many representatives from great companies like Facebook, LinkedIn, DropBox, Qualcomm, and many others who were enthusiastic about going to UCI to meet our WICS members! We also attended several workshops for professional development, technical issues in the industry, as well as how to be an effective organization for women in ICS. On a lighter note, we attended two dances, ate the ridiculous amounts of desserts served at the conference, and picked up tons of free goodies. 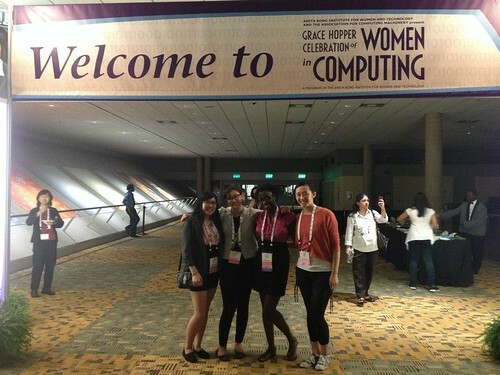 Check out our Flickr photostream for pictures of our experience at Grace Hopper. At our next meeting on Tuesday, October 9th we will be giving away a bunch of company swag and we will raffle off a Google shirt!